Cave Creek Canyon is located in the Chiricahua Mountains of Southeastern Arizona. The mouth of the canyon is at the small community of Portal, AZ. From Tucson, take I-10 east to Exit 5 (Road Forks) in New Mexico. 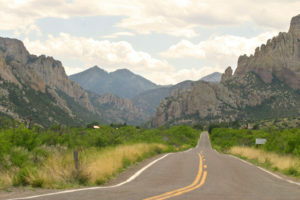 Take NM Route 80 South for 28 miles to the intersection with NM Route 533. The Chiricahua Desert Museum will be on the left and the Corner Swap and Shop will be on the right. Turn right at the sign for Portal and follow Portal Road for about 7 miles to the small community of Portal, AZ. Continue on Portal Road about 3/4 miles where the road makes a 90 degree bend to the left. Keep left and the USFS Visitor Information Center is less than 2 miles ahead. From the East, take I-10 west to New Mexico Exit 5 (Road Forks), then take NM Route 80 south and follow the directions above. Gasoline is not available in Road Forks, Portal or Rodeo. We recommend filling your gas tank in San Simon, AZ, or Lordsburg, NM, prior to arriving in the area. Fuel is also available in Animas, NM, on Route 9, twelve miles east of Route 80 mile marker 8, at Valley Fuel and at Bootheel Grocery. Cell service is limited in the Portal area, especially in the canyon. A Verizon Wireless signal is available in open areas with a direct “line of sight” toward Animas. Phones with other service providers are especially difficult to use. WiFi is available at the Portal Library, the Forest Service Visitor Information Center (during open hours) and at some local businesses. Lodging in the area varies from a guest ranch with 11 cottages and apartments all with kitchens, a lodge with 16 motel style rooms, a number of small guest cottages and B&Bs, an RV park, and multiple developed campgrounds and dispersed campsites. For a full list of local lodging opportunities, click here. Portal Store and Cafe – check portalrodeo.com for days the café is open. The Rodeo Tavern — Call (575) 557-2229 for Tavern hours and check portalrodeo.com for days the café is open. The Rodeo Grocery Store and Cafe is open for breakfast and lunch Monday – Saturday. Call for hours (575) 557-2295. PW is located in Animas and serves pizza and sandwiches. Closed Sunday. Closes at 5:00PM weekdays. The Portal Store and Rodeo Grocery have limited grocery items. In Animas, NM, (where gasoline and propane are also available) Valley Mercantile and Bootheel Grocery both have essential grocery items. For major grocery shopping on your way to Cave Creek Canyon, Douglas, AZ, 50 miles south of Rodeo, has Walmart and Food City; Lordsburg, NM, and Deming, NM, (I-10 northeast of the Chiricahua mountains) both have grocery stores, as does Willcox, AZ (I-10 northwest of the Chiricahua mountains). Arizona does not observe Daylight Saving Time. During DST months there is a one hour time difference between Portal and Rodeo.